Participating in no fewer than five sports in an age of increasing athletic specialization, Garrett Gillick established himself as perhaps the most versatile performer of the 1990’s at Lowell High School. During his four years at Lowell High School, Garrett was a member of the basketball, wrestling, track, football, and baseball programs. Garrett’s performances on the gridiron and the baseball diamond, however, earned him his true plaudits as a Raider athlete. As a member of the Red and Gray football team, Garrett displayed his versatility, playing successfully at a variety of positions including quarterback, running back, tight end and linebacker. A two-time (1994–1995) Merrimack Valley Conference All-League and Lowell Sun All-Star selection, Garrett was the Raider Captain and team MVP during the highly successful 1995 season. Garrett was selected as a member of the Boston Globe Division I All-State Team at the conclusion of that season. As a catcher for Coach George Cunha’s LHS baseball team, Garrett was a mainstay on two highly successful squads. In his junior season (1995) Garrett hit a team 1gh .366 as the Red and Gray advanced deep into the Eastern Mass Division I State Tournament with a 19–4 record. As a senior Tri­Captain in 1996 Garrett his .357 and led the team in stolen bases (12) and walks (17), as LHS compiled a 15–6 record. Garrett was honored as an MVC Large School and Lowell Sun All-Star selection in both 1995 and 1996. His career batting average of .362 ranks high on the all-time LHS list. As a fitting culmination to his career at Lowell High School Garrett received the John Beaulieu Award as the school’s most outstanding senior male athlete. Garrett attended the University of Maine, where he played four years under Coach Jack Cosgrove. 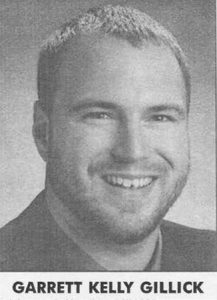 Garrett started 33 consecutive games for the Black Bears, recording 120 unassisted tackles, including 63 in his senior year (1999). He received the Senior Achievement Award after his final season.